This set holds a special place in my heart for its disco-style borders, dizzying color combos, and standout roster of players: Aaron, Mays, and Bench in the NL, with Reggie, Yaz, and Carew in the AL, to name but a few. The logos remind me specifically of Schoolhouse Rock! cartoons, which an advertising team pitched in 1972. Safe to say my childhood would be totally different without baseball cards and those Grammar Rock episodes. Not many guys hit multiple grand slams in a year. The single-season leaders are Travis Hafner (2006) and Don Mattingly (1987), who both hit 6. 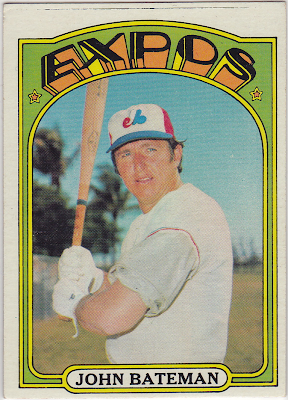 No one in 1971 hit more than 2, so John co-led the National League with Willie Stargell. It's not hard to find Bateman's slams in the batting log, since you'll get at least 4 RBIs out of it. Both homers came with two outs, pretty dramatic moments for any guy's career. Like many catchers at 30, John was just about done behind the plate. 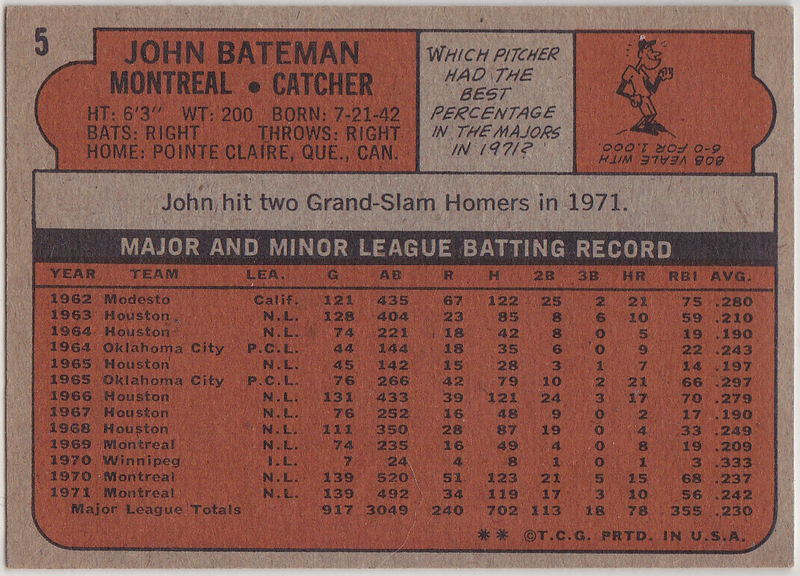 Montreal traded him to Philly mid-season for 77 games of Tim McCarver, another guy on his last legs in catching gear. Bateman retired after 1972 and McCarver spent his remaining years as a part-time player for Boston, St. Louis, and back again in Philadelphia, even playing six games (and collecting his final hit, a double) for 1980's first title winner. Value: 1972 singles cost about a quarter. Fakes / reprints: Topps reprinted several 1972 stars as inserts into modern sets. Look for a glossy finish and gold foil to distinguish reprints from originals. Just wanted to add that Bateman was actually at one time a member of King Eddie Feigner's "Court". Eddie wrote me a great note about him one time so since then I've taken a liking to all things Bateman. Thanks, Jason, didn't know anything about Feigner! Here's a good obit and story about the great ballplayer and showman for others in the same boat.